Tunisia is home to over 3,000 years of history ranging from the Phoenicians, who founded the ancient city of Carthage to the French in more recent times. The biggest name in Tunisian history is Carthage  arch rival of Rome in the second and third centuries BC and a Phoenician trading post founded at the end of the 9th Century, that developed into one of the most prosperous and powerful cities in the western Mediterranean. By the end of the 6th Century BC it was one of the main powers of the Mediterranean. During the second and third centuries BC Carthage came to blows with Rome, one of the other great powers of the Mediterranean, in the infamous Punic Wars. Despite successful battles waged by Hannibal, the Punic general who had lead his army, backed by elephants over the Alps into Italy, Carthage suffered in the last war, when the city was destroyed by the Romans, and its people sold into slavery. The Romans colonized most of Tunisia, building magnificent towns, such as Dougga and Sbeitla along the way. In AD 436 Tunisia was invaded by the Spanish Vandals, who ruled until the Arabs arrived in AD 670 and spread their power across North Africa. The Arabs were later followed by the Ottoman Turks and then the French in the 19th century. Tunisia was granted independence from the French on 20th March 1956 and Habib Bourguiba became Tunisias first President.Despite completely destroying Carthage, the Romans left some amazing sites in Tunisia. 2 in 1- Something different. Fantastic afternoon and evening, not to be missed. Highly recommended for families. 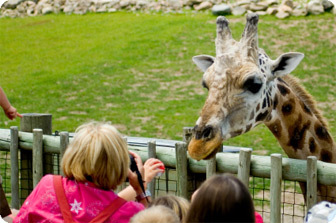 Enjoy the mini Safari park at Friguia  For Grown-ups and kids alike. Enjoy the African Zulu show whilst having your meal. (including free drinks). Something very very special  The only park of this kind in North Africa. Three in one excursion departing for Tunis the capital city of Tunisia visiting the incredible « Bardo » museum to see the famous mosaiques- free time in the medina Tunis-onto visit the roman ruins of Carthage and the prettiest village of Sidi-Bou-Said with spectacular views. 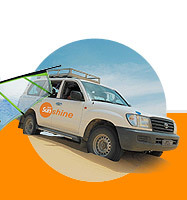 Overnight stay in the Sahara Desert This excursion should not be missed. Visit the roman amphitheatre of El Dejm and then onto Matmata to visit a home of the troglodytes who live in cave like dwellings. Ride a camel into the Sahara Desert. Overnight stay at a Four Star Desert Hotel Visit the holy city of Kairouan. 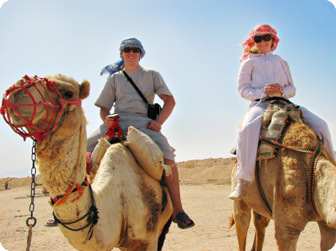 Cross the salt lakes Discover 2/3 of Tunisia with this superb two day safari. Book early as this excursion is very popular! SEE YOUR REP FOR MORE DETAILS  ALTERNATE SAFARIS AVAILABLE. Arrival to Tunis Airport, transfer and Overnight at El Mouradi Palace 5* in Port El Kantaoui Resort. 10h15: Continuation towards Matmata via Gabes. 12h30: Arrival at Matmata, visit of a troglodyte habitation followed by Lunch at the restaurant Les Berbères. 14h00: After lunch, depart to Ksar Ghilane. 17h00: arrival at Pansea site, Dinner and overnight under a tent. 08h00: After breakfast, depart to Ksar Hedada and Medenine, visit of Ghorfas. 12h00: Lunch at restaurant Fella. 09h15: Depart to Metlaoui, board on the Lezard Rouge, an ancient red train belonging to the Bey of Tunisia to discover Selja. 12h30: Lunch at restaurant Selja Metlaoui. 13h30: Continuation onto Kairouan via Gafsa. 16h00: Arrival to Kairouan, free time at the Médina and a visit of a carpet factory. Return and overnight at El Mouradi Palace. 11h55: Depart to El Mouradi Hammamet 5*. 11h00: Continuation onto the Bardo Museum. 12h30: Depart to Gammarth. Lunch at Hotel El Mouradi Gammarth. 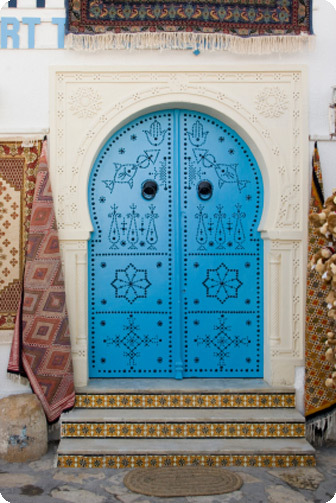 15h15: Continuation onto the picturesque village of Sidi Bou Said. 16h30: Return to El Mouradi Gammarth.